Facebook Has Already Trademarked 'Face' In Europe – Is 'Book' Next? 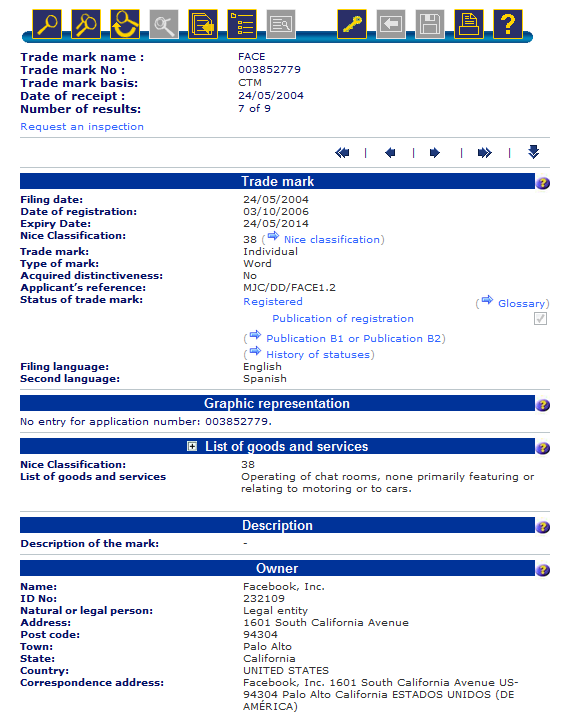 I was aware that Facebook is close to trademarking the term ‘face’, at least in relation to online social networking and related activities, in the United States. But as far as I know, nobody has yet pointed out that Facebook has already pulled that stunt in the EU, i.e. the union of 27 European member states (which include the UK, Germany, France and Spain). Mark Brooks, an authority in the online dating industry, was kind enough to point me to the filing (screenshot below), which – surprisingly – dates back to May 2004, when Facebook was still in its very early days. 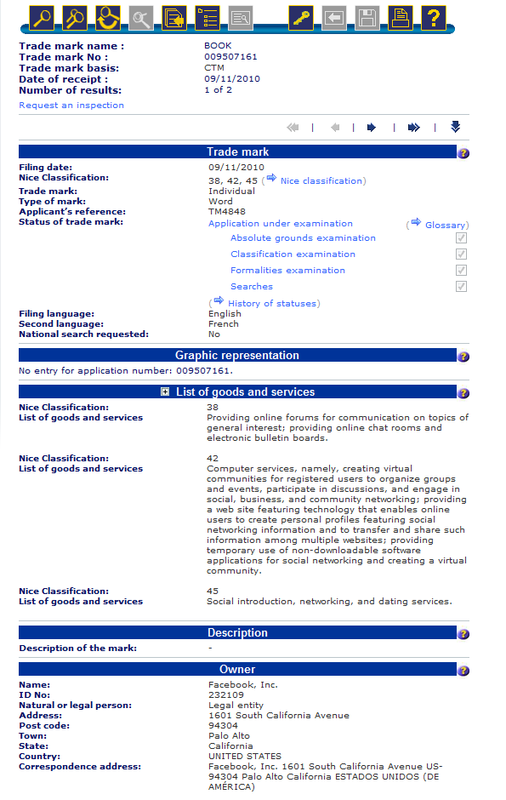 As you can tell from the screenshot, the EU-wide trademark (in relation to usage of the word in the operation of online chat rooms, we should point out) was granted in October 2006, with the expiration date set to May 24, 2014. Again, I’m not entirely sure this hasn’t yet been reported, but I couldn’t find any coverage of it after some sleuthing, so figured I should report it here if only for posterity’s sake. It gets more interesting, though. Like in the United States, Facebook is also pursuing a trademark for the term ‘book’ in the European Union, notably in relation to online communities, social networking and Internet dating services. This filing was made more recently, in early November 2010. The application is still under examination by the OHIM, the trademark and designs registry for the internal market of the European Union. Evidently, we’ll be keeping an eye on it. Obviously, this move is likely to raise further questions over the company’s motives. TechCrunch readers will be aware that the social networking giant has already waged wars against sites using the word ‘book’ in their names (see the Lamebook and Teachbook cases). Facebook has also pushed travel site PlaceBook to alter its name to TripTrace. I’ve asked Facebook for comment and will update when I hear back.